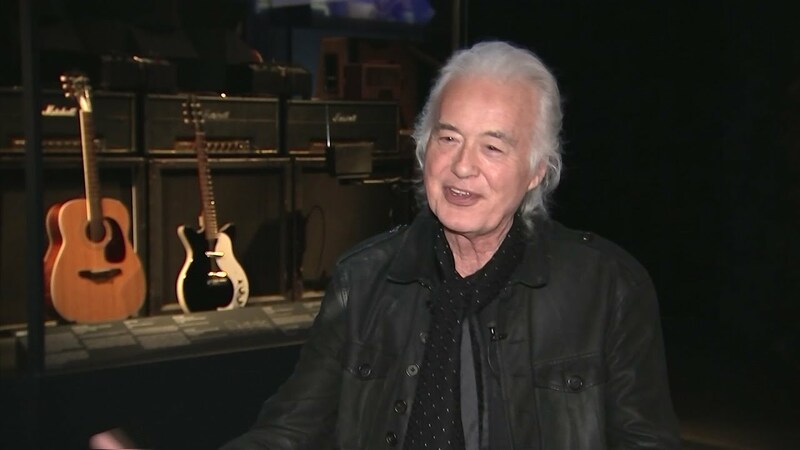 Some of Jimmy Page’s iconic music gear – including the acoustic guitar he used to write “Stairway To Heaven”, among other Led Zeppelin classics – can be seen in a new video promoting a new exhibit set to open next week at The Metropolitan Museum of Art in New York. Running April 8 to October 1, “Play It Loud: Instruments of Rock & Roll” is billed as the first major exhibition in an art museum dedicated entirely to the iconic instruments of rock; featured are more than 130 instruments dating from 1939 to 2017 – played by artists like Chuck Berry, Eric Clapton, Bob Dylan, Jimi Hendrix, James Hetfield, Elvis Presley, Keith Richards, Bruce Springsteen, Eddie Van Halen, Stevie Ray Vaughan and more. "I've loaned my Harmony guitar, which was a Harmony six-string acoustic,” Page tells the Associated Press in a new video report. “That guitar I had way back in the early '60s, and it was with me all the way through to the point that I used it as a writing tool. And that particular guitar is the vehicle whereby the first album of Led Zeppelin is written, the second album is written, the third album is written, and the fourth album is written. And it's the guitar that actually culminates in playing 'Stairway To Heaven'." Co-organized by Jayson Kerr Dobney, Frederick P. Rose Curator in Charge of the Department of Musical Instruments at The Met, and Craig J. Inciardi, Curator and Director of Acquisitions of the Rock & Roll Hall of Fame, the concept of the exhibit was an immediate hit with the Led Zeppelin legend. “I said, 'What would you like? Just tell me what you want to help this along, and you can have whatever it is that you want.'" Organized thematically, Play It Loud will explore how musicians embraced and advanced emerging technologies; the phenomenon of the “Guitar Gods”; the crafting of a visual identity through the use of instruments; and the destruction of instruments in some live performances, one of rock’s most defining gestures. Following its presentation at The Met, “Play It Loud” will travel to the Rock & Roll Hall Of Fame in November. Page and Led Zeppelin are currently celebrating their 50th anniversary with a series of releases and projects.